CAPE CANAVERAL — With its liftoff just 18 days away to deploy a new Global Positioning System satellite, stacking of the next United Launch Alliance Atlas 5 rocket began today at the vertical assembly building outside Complex 41. It will be the third launch just this month for the Atlas 5 program, following the commercial flight with the Mexican Morelos 3 mobile communications satellite on Oct. 2 from the Cape and the classified NROL-55 mission for the National Reconnaissance Office from California on Oct. 8. The Oct. 30 launch will haul the Global Positioning System 2F-11 satellite 11,000 nautical miles above Earth to replace a 12-year-old, aging spacecraft in the navigation network. The available launch window extends from 12:17 to 12:35 p.m. EDT (1617-1635 GMT). The rocket, designated AV-060, will stand 189 feet when fully assembled and fly in the basic, 401-variant that features an RD-180 main engine powering the first stage and an RL10 on the Centaur upper stage. The satellite will be enclosed in a 39-foot-long, 14-foot-diameter aluminum nose cone for atmospheric ascent. 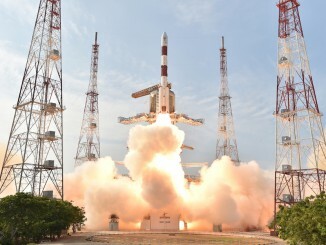 This new satellite will take the place of the GPS 2R-10 craft launched aboard Delta 302 on Dec. 21, 2003 into Plane E, Slot 2 of the constellation. The old craft moves to a backup role in the network once the fresh GPS 2F-11 enters service. 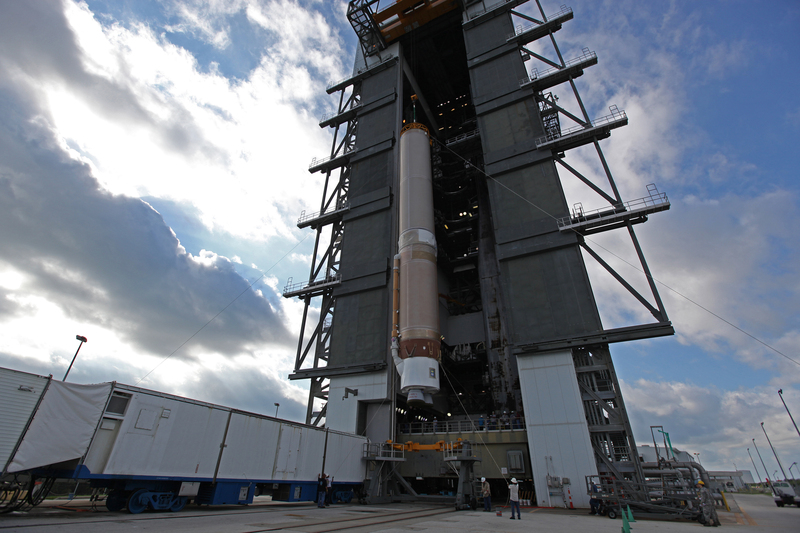 The Air Force has used ULA vehicles to launch new GPS satellites two times already this year, following a Delta 4 deployment flight successfully carried out March 25 and an Atlas 5 on July 15. For ULA, GPS 2F-11 represents the 11th launch of 12 scheduled this year and the company’s 102nd mission overall since formation 106 months ago. The stacking work for the Atlas began this morning as the bronze-colored, 106.6-foot-long, 12.5-foot-diameter first stage was pulled to the Vertical Integration Facility doorway, erected upright and hoisted inside the building to be put aboard the mobile launcher platform. Known as the Common Core Booster, the stage produces 860,000 pounds of thrust to lift the rocket off the ground. It burns kerosene fuel and supercold liquid oxygen during the initial minutes of flight. Upcoming, the barrel-like interstage adapter and Centaur upper stage will be lifted in place. Centaur is 41.5 feet in length, 10 feet in diameter and is fueled by liquid hydrogen and liquid oxygen. The payload is undergoing its own processing at a nearby Air Force facility. GPS 2F-11, a 3,400-pound, modernized navigation satellite made by Boeing, features improved accuracy, enhanced internal atomic clocks, better anti-jam resistance and a civil signal for commercial aviation. 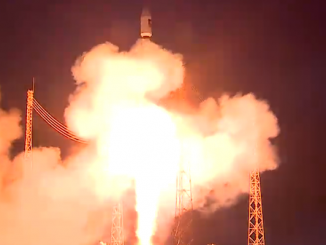 It is the 11th of 12 Block 2F satellites to launch. 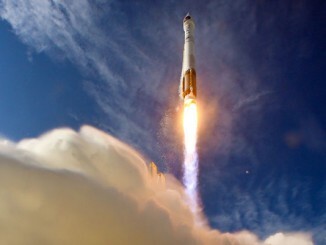 This marks the 71st GPS satellite launch since 1978, the 16th to use an Atlas rocket and the fifth Block 2F on Atlas. The single biggest customer of ULA launches has been the Global Positioning System, which has used all three rocket families to carry replacement satellites into space 15 times thus far, representing a combined mass of 56,000 pounds of payload.